Aquarium Information -A great source for current aquarium information that is updated regularly as new research become available. Quinine drugs work by causing a pH elevation in intracellular organelles of parasites, this is thought to disrupt the intracellular transport of membrane components and macromolecules, and phospholipase activity leading to cellular failure of these parasites. In marine aquariums, Chloroquine Phosphate is generally the better choice over Quinine Sulfate. Chloroquine Phosphate is more effective from my experience (but also more easily and fatally overdosed). When combined in a synergistic combination with Pyrimethamine, as in the product "AAP Marex", it is even more effective for treatment of Oodinium as well as other Ectoparasites and Flukes (Pyrimethamine is generally used to treat serious parasite infections [toxoplasmosis] of the body). This synergistic Chloroquine Phosphate/Pyrimethamine combination is the fastest acting treatment I have ever used for Oodinium, although I have often found a follow up treatment with Copper or keeping the main aquarium without fish for 4 weeks will improve long term results (as copper seems to have more long term permanent killing power). Quinine Sulfate/Hydrochloride is useful for resistant strains of Ich (especially on scale less fish), as well as Protozoan caused sliminess of the skin and Rams disease (symptoms of whirling disease). Replacement of your UV Sterilizer's UV Bulb/Lamp every six months with a true level 1 capable bulb is a MUST for optimum disease prevention and aid in Redox balance. The ONLY Authorized online seller of the full line of this unique product. Only FRESH product, not clearance product!! 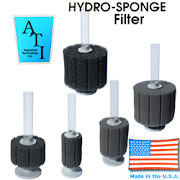 THE PREMIUM Aquarium Sponge Filter with as much as 5 TIMES the bio and mechanical capacity of commonly sold Chinese knock offs!! Merbromin is a lessor known product to many newbies in the hobby due to difficulty in obtaining, but to those who have been in the industry and hobby for a long time its benefits are well known. Merbromin (AKA Mercurochrome) is a topical antiseptic often used for minor cuts and scrapes in people. Merbromin is an organomercuric disodium salt compound and a fluorescein. It is useful on external infections because of its permanence, and lethality to bacteria, in particular Columnaris. Part of the difficulty of obtaining this product was concerns over its mercury content, however due to the low cost versus high costs of producing studies to disprove these allegations (which were never proven), most production has stopped for human use. 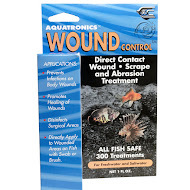 AAP/Aquatronics Wound Control/Merbromin is a swab or paint-on disinfectant with PVP emulsifier for: wounds, scrapes, and abrasions as well as opportunistic bacterial infections that often result from these problems. A topical antiseptic and oxidizer used for injuries, exposed wounds & open sores (with both bacterial and fungal infections), and exposed multi cell parasites such as Anchor Worm. Due to its anionic character, it is often an excellent choice for exposed EXTERNAL bacterial or fungal pathogens (including some parasites or at least secondary infections there of). However for this same reason if much living tissue is exposed or for gills, Methylene Blue would be a better choice. 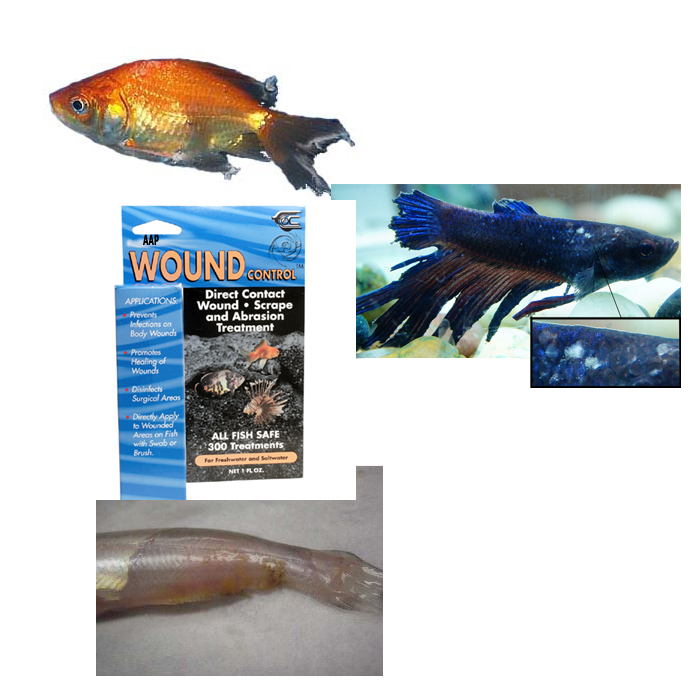 Wound Control should also be used after any operation such as extraction of visible parasites. All Fish safe assuming the fish can be safely handled without causing further injury. Net the fish. Gently use the net or hand to hold the fish in place (applying Req-Q, StressGuard or similar to your hand or net prior to application may be helpful). Apply Wound Control through the net or use a cotton swab to apply directly on the area. This article covers many aspects of Aquarium & Pond UV Sterilization from how, why, facts, myths, and maintenance including the importance of changing UV Bulbs regularly. Berberine is a plant based alkaloid that has been used medicinally for a long time in both Ayurvedic and Chinese medicine. The Berberine alkaloid is present many plants including: Hydrastis canadensis (goldenseal), Coptis chinensis (Coptis or goldenthread), Berberis vulgaris (barberry), Berberis aristata (tree turmeric), and most notably Berberis aquifolium (Oregon grape). The berberine alkaloid is generally found in the roots, rhizomes, and stem bark of the plants. Berberine extracts and extractions via boiling of dissolved chemicals in the plant roots have demonstrated significant antimicrobial activity against a variety of organisms including bacteria, viruses, fungi, protozoans, helminths, and chlamydia. Currently, the predominant clinical uses of berberine in human use includes bacterial (especially of the gut) diarrhea, intestinal parasite infections, and ocular trachoma infections. 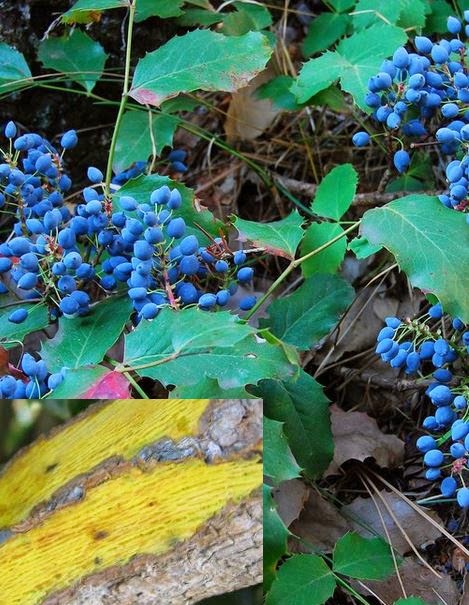 Oregon grape root has synergistic antibacterial, anti-inflammatory, and bile-stimulating properties as well. The picture above shows an Oregon Grape Root Plant along with the rhizomous roots with their brilliant yellow pigment in the inner bark shown in the inset. Aquarium or pond use of Oregon Grape Root is still in its infancy as of writing this article, however based on human use, and how this this product works, there is clearly a lot of promise as both a treatment of its own and as a back up to other treatment in wide ranging problems from Columnaris to internal parasites of fish. Oregon Grape Root has potential to aid in antibiotic effectiveness in treatment of difficult to treat diseases such as Columnaris as it contains a specific multi drug resistance pump inhibitor (MDR Inhibitor). Resistant bacteria work by utilizing a pumping mechanism in its cell that when antibiotics enter that cell the pump immediately pumps out the antibiotics so it can have no effect on the MRSA cell. Oregon Grape Root works by blocking the bacteria's ability to pump out antibiotics. Use; Do NOT use tinctures, rather powdered forms that are generally available in capsule form, although concentration can vary greatly (I recommend Solaray brand from Nutraceutical, but I have not tried evert brand either). Current and experimental use is opening a 400 mg Oregon Grape Root Capsule into 10 gallons of water along with the antibiotics such as Nitrofurazone and Kanamycin. 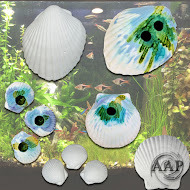 This can be added to the aquarium or a fish bath that also employs Methylene Blue and possibly other antibiotics (20-30 minutes in a fish bath). Use in conjunction with other medications is suggested in most moderate to serious infections or internal worm infestations. Copper has long time been used for treatment of aquarium algae, fish parasites, and snail eradication. This includes external treatment of freshwater and marine Ich, Oodinium, and fungus. It is has been said on popular aquatic sites, that people are attracted to using Copper as a treatment in the display tank, because it does not discolor the tank, but with using Copper, caution and some understanding does needs to be involved. Improper use can cause harm to the tank. Water chemistry and other environmental factors will determine dosing details of the Copper treatment. The Copper used for treatments can stay in a tank for close to a month. If there are any live rocks or ornaments in the tank, the Copper will be absorbed into the material and slowly lech it's way back out. There are only certain ways to remove the Copper from the water, which is one reason to use caution. This is something I will go into later in this post. A certain level of Copper concentration is required for an effective treatment, and is different depending on tank needs. These therapeutic levels can become toxic to other fish species and invertebrates in the tank. This is another reason why caution needs to be used with this treatment. Chronic use of Copper will affect fish health. Higher levels can damage fish gills and other body tissues. It has also been shown that there is a decrease in fish immunity, with chronic use (Yanong2, 2013). The use of Copper in low pH can become even more toxic, so much more caution needs to be used. Not only is copper more toxic in acidic water, but the acidic water itself can be a problem. In fact, when the pH is below 6.4, the helpful, nitrifying bacteria in your aquarium begin to stop functioning. Dangerous level of copper for shrimps is 0.03 mg per litre. 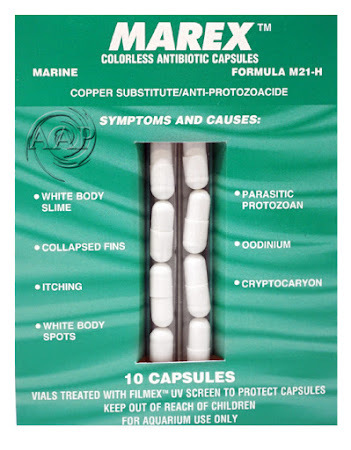 Dangerous level of copper for algae and bacteria is 0.08 mg per litre. Dangerous level of copper for some fish, snails and plants is 0.10 mg per litre. Copper will need to be maintained at least at 0.12-0.18 mg/L and for a therapeutic level and for no less than 14 days(Blasiola,2000,p.146). A note for marine tanks, the amount of copper you will need to add for treatment, will be high initially, but then will need to be brought down over subsequent days. Copper will be absorbed into corals and substrate, to the point no more Copper is absorbed. This needs to be taken into account when attempting to maintain a therapeutic level. This is mainly important for treatment of display tanks, but is not something to worry about for bare hospital tanks. Note: Copper basically kills parasites by poisoning them more than the fish, so never over dose! Always have a copper test-kit on hand! Do not use with snails and invertebrates. Do not use in reef aquariums and note; when used as an algaecide, the copper is absorbed by the algae then released when it dies. Copper is a heavy mental that can be found naturally in many forms. The form of Copper that is typically used in aquarium set-ups Copper Sulfate, or properly known as Copper Sulfate Pentahydrate. The reason this form of Copper is used, is when it is placed in water it dissolves and attaches to the most water molecules. During this process, Copper Sulfate splits into Copper (Cu2+) separately and Sulfate, along with water. It is strictly the Copper (Cu2+) that is measured and used to combat a number of issues within the tank. Like stated before, maintaining proper levels of Copper Sulfate can be difficult because of other components in the tank, such as Carbonates, which are part of Dolomite, which when dissolved can become complex and remove the Copper. Also, other living organisms can bind to the element, which effects levels. There is also Chelated Copper, which is a compound added to Copper Sulfate. These agents help keep Copper in a solution by forming a ring structured Copper. These complexes become stable in a different form and more of a complex form of treatment. For the most part, most aquarium keepers use Copper Sulfate rather than Chelated Copper, because of the strength and the difference in effort to remove the treatment from the tank. The use of Chelated Copper is advised only in hospital tanks. Because Copper can be difficult to dose, after figuring out the amount needed for your tank and needs, start the dosing amount at half the amount! This is best done by mixing the Copper Sulfate with some distilled water. In marine tanks, add half of the mixed solution to the sump and the other half to the tank, so to miss all of the "hot spots" in the tank. Make sure not to add high amounts of Copper to the sump as it can damage the biofilter by killing beneficial bacteria. After the Copper has been in the water cycle long enough and has equally distributed, then measure the Copper levels. Add more Copper, allow it to mix and re-measure until the concentration levels are met. Often, due to binding (adsorption) of Copper to components of the system, more Copper than the amount calculated initially will be needed to reach the appropriate concentration. Copper measurements should be taken twice a day, with more copper added if necessary. As discussed previously, treatment may last 3–4 weeks or more, depending upon the target organism and specific situation. Treat based on what solution you are using, but try to bring your Copper level to .15 -.20 ppm for Oodinium/Brooklynella (and most freshwater applications) and .20- .25 ppm for Crytocaryon. Please revisit the therapeutic levels I stated above. Generally, it is easier to maintain these levels, while not having to do repeat testing and follow-up dosing, while using Chelated Copper, but please remember the use of a hospital tank. When treating a tank, make sure all materials and filtration component (ie. carbon) are removed. If necessary, high organic bioloads or detritus should be removed. Baseline water parameters should be check prior to treatment. This includes, ammonia, nitrite, pH, temperature, alkalinity, and salinity. Gradually dose to the therapeutic level over a 2-3 day span. This allows time for the fish to increase internal and physiological mechanisms to protect their bodies against the toxicity. Wait 2-4 hours to add after use of any water Redox reducing water conditioners. This will include SeaChem Prime, Kordon Novaqua, Kordon Amquel, Jungle Start Right, API Stress Coat, etc. 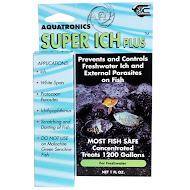 Use in aquarium systems that have an established healthy bio filter. Do not mix with Sulfa based treatments/medications. High quality active Carbon will do the trick for removing Copper. You can place a separate filtration unit containing fresh, activated charcoal at the rate of 170 grams per 57 liters of water (about 0.375 lbs per 15 gallons) on a system to remove Copper. Once all the water has cycled through the carbon, test for free copper concentration. If Chelated Copper has been used, water changes will be necessary. Dolomite may also be used, if it is removed afterward. If tests continue to show a high free Copper concentration, a complete water change may still be required to remove copper from the water. Copper levels should be monitored throughout this process and for several weeks afterward, in case Copper that was previously bound to substrate or complexed in solution, is released as free copper. THERE IS NO MORE EFFECTIVE treatment for Fish Columnaris!! For unique aquatic products (most professionally tested). MARDEL, KORDON TREATMENTS - Quick Cure, Clout, Copper Safe, Herbal Ich Attack, Methylene Blue. Such as Pimafix, Melafix, Furacyn, Tetracycline & Triple Sulfa. - Mineral Ion control, and ich and fungus treatment. 9 Watt UV Bulbs to fit most compact UV Sterilizers/Clarifiers such as Tetra UV1, UV2, Cyprio Vorton 500, 1000, 4000, Nursery Pro UltraClean and many others! AQUARIUM INFORMATION A GREAT Resource for current aquarium information articles, directories, and products!